When Should You Replace the Head Gasket on a MINI Cooper | Bavarian Auto, Inc.
MINI Coopers have become known throughout the country for superior performance and a large part of that is their powerful and reliable engine. The head gasket is an important component under the hood as it’s built to handle high and low-pressure levels and is used to cover the cylinder head to help prevent any oil or fluid leaks in the engine. 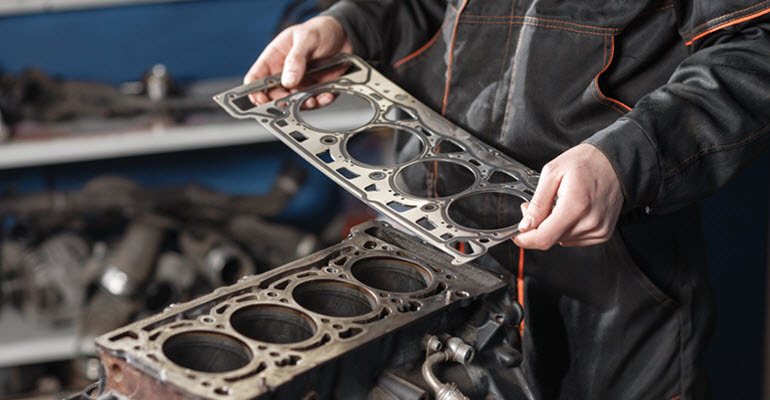 Because of its importance and high functions any time there is an issue with your head gasket it’s important to have it checked out immediately to prevent long-term issues from developing. Whether it’s just simple repairs or complete replacement, these are just a few of the warning signs to look for that indicate something is wrong with your head gasket. Any time there is a fluid leak it is an obvious sign that something is not working properly. Check and see if you can determine what kind of fluid it is that is leaking as it can help you identify the source of the problem. From there you can visit your mechanic to determine the best course of action and see where any damages have occurred to the head gasket or other areas. An overheating engine is a telltale sign that something is wrong with your head gasket. Leaking oil or other fluids will cause your engine to function at a lesser level and will lead to overheating. If your engine is excessively overheating then it’s important to have your head gasket and entire engine checked out to ensure that no severe damages have occurred. If excessive leaking is occurring or there are damages in your head gasket then you’re likely to start noticing unusual smells from your radiator or from your exhaust. Leaking oil or other fluids can burn and will smell awful depending on the type of fluid that is leaking. This is a big sign that the head gasket is either broken or the seal is damaged and not able to contain the oil properly. Another clear sign that the head gasket is damaged is if you find engine oil and coolant mixed together in the engine itself or throughout your cooling system. Usually additional tests will be needed to determine the exact issue but oil and coolant mixtures often indicate head gasket issues. If you believe that your MINI Cooper’s head gasket has sustained damage then it’s important to avoid driving it. Driving with any head gasket issues can compound the damages or lead to other problems such as a blown engine. Instead, seek out the help of a trained MINI Copper mechanic and get the issue diagnosed as soon as possible. If need be you may have to have your car towed to the shop in order to prevent further damages being inflicted. At Bavarian Auto in Chattanooga has been helping MINI owners for years. Our mechanics have decades of experience working with MINI Coopers and all other models and offer quality services at a fraction of the cost of the dealerships. If you suspect something is wrong with your car’s head gasket we will use the latest available tools and equipment to find the exact source of the problem. All of our mechanics are ASE certified and are committed to ensuring that your car receives the high quality of service it needs to maintain peak performance. For most cars head gaskets can fail at any time but will typically last up to 100,000 miles if you properly follow service schedules for oil and coolant services. Aggressive driving and failure to maintain routine oil changes and coolant checks can all contribute to rapid wear and tear on your head gasket. Whether your MINI is experiencing issues with the head gasket or you would like to schedule a routine service appointment with one of our mechanics please call or visit Bavarian Auto today. We’re here to help you take proper care of your MINI without all of the high costs and headaches of going directly to the dealership.